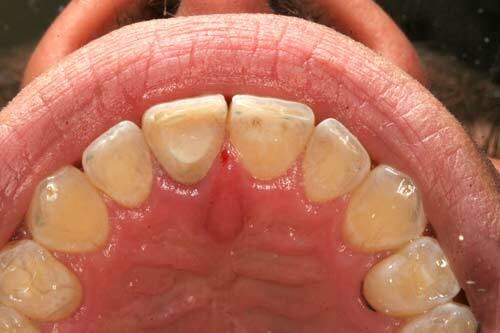 A tooth may discolor after trauma, if the nerve dies, or even some time after a root canal treatment. It looks unsightly, especially if it is a front tooth. 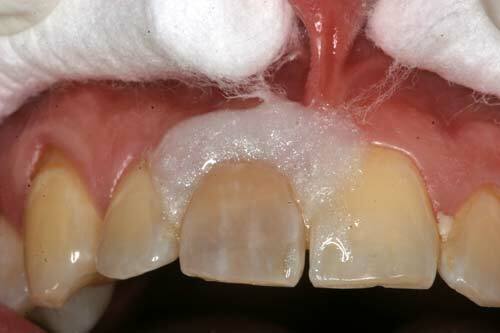 These teeth can be bleached from the outside and inside simultaneously. 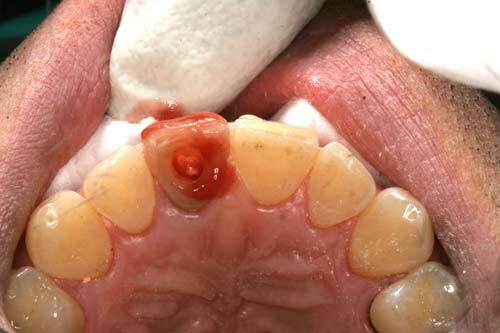 The filling in the back of the tooth is removed, exposing the hollow pulp chamber, which will contain some old cement or the pink latex-like gutta percha, or the filler that is conventionally used to seal the root canal. 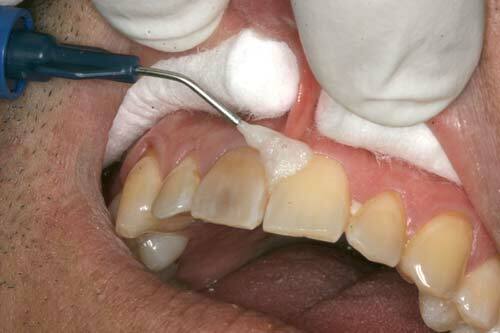 The gums around the teeth have to be isolated in order to prevent contact with the bleaching gel. 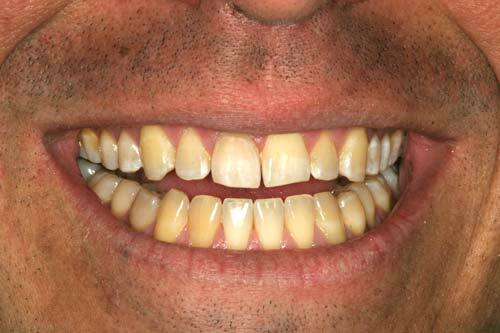 This is achieved in this case using a light-hardening gel, Opal-dam from Ultradent®. A power-bleach is used, which is either chemically-activated immediately prior to use, or light-activated after placement. 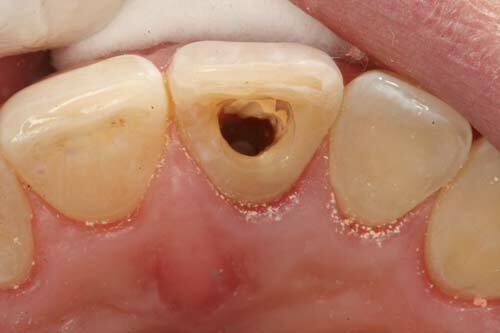 The front and the chamber of the tooth are covered by the gel. This procedure is repeated every 10 minutes until an acceptable shade is achieved. The gel is then finally washed off and the isolating barrier is removed. 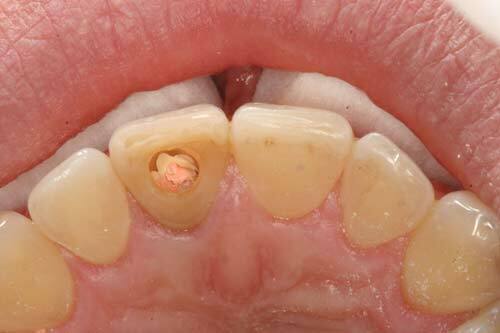 The hole in the back of the tooth is then bonded with a composite. 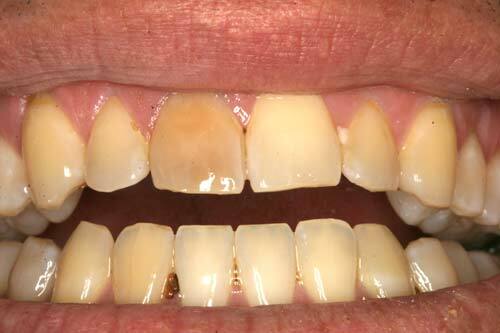 Most of the time the whitening will be sufficient to avoid further treatment. In some cases veneering the teeth would be a nice option but in the majority of cases the color of the bleached tooth will match all the other teeth perfectly to have the patient smile widely without hesitation. 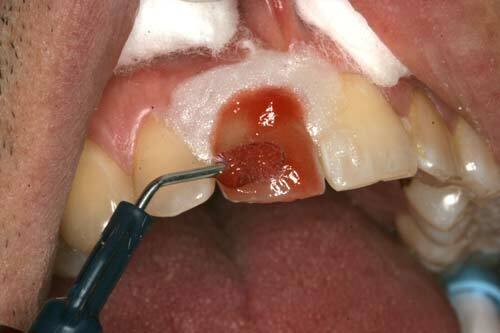 This entry was posted in Cosmetic Dentistry, Tooth Bleaching and tagged Cement, Nerve, Root Canal, Veneer by Admin. Bookmark the permalink. Hi Jefferson, the best would be to call the office to discuss the specifics of your situation.